Saudi journalist Jamal Khashoggi disappeared after entering the Saudi consulate in Istanbul in early October and is feared dead. Turkish officials have accused Saudi Arabia of killing Khashoggi on orders from the highest levels of its government, and the evidence is damning. Reports suggest Khashoggi’s death was a result of orders from Crown Prince Mohammed bin Salman. Trump has largely stood by the Saudis throughout the investigation, and has repeatedly defended its rulers. The president’s approach to the Khashoggi case follows a familiar pattern to his playbook on Russian election interference. Trump has made a habit of placing trust in leaders with dubious reputations, perhaps most notably Russian President Vladimir Putin. There’s an expanding mountain of evidence that journalist Jamal Khashoggi was brutally killed in the Saudi consulate in Istanbul, and multiple reports suggest his death was a result of orders from the highest levels of the kingdom’s government, including Crown Prince Mohammed bin Salman. But US President Donald Trump has largely stood by the Saudi leadership despite the troubling allegations. Based on what we know about the Khashoggi investigation and Trump’s overall reaction to it, the president is placing his trust in a leader – the crown prince – who is either being deliberately deceptive or has people working for him who are uncontrollable. Khashoggi, who’s often been critical of Saudi leadership in his writing, entered the consulate on October 2. He never came out. The Saudi government has vehemently denied any involvement in his disappearance and originally claimed he safely departed the consulate, but provided no proof. Reports this week have suggested they are considering changing that story, admitting he was killed but blaming it on a botched investigation without clearance from the government. Turkish officials have said they have audio and video recordings that proves Khashoggi was killed in the consulate. Turkish officials have suggested the Saudis sent a 15-man team to Istanbul that interrogated, tortured, drugged, and killed Khashoggi before dismembering his body with a bone saw and sending it back to Saudi Arabia. One of the people suspected of being involved in Khashoggi’s disappearance has been identified as a frequent travel companion of the crown prince, according to The New York Times. Trump has opted to side with the Saudis, repeatedly touting denials of any responsibility for Khashoggi’s fate from both the crown prince and his father, King Salman, while exhibiting a deep reluctance to punish the kingdom. For example, Trump said it would be a “tough pill to swallow” to reduce or cease US arms sales to the Saudis. Congressional leaders have condemned Trump for his response. “I think the Saudis believe they have a blank check from this presidency. I’m very concerned that US national security policy is for sale,” Sen. Chris Murphy, a Democrat from Connecticut and member of the Senate Foreign Relations Committee, told Business Insider. On Monday, Trump suggested “rogue killers” could be behind Khashoggi’s disappearance. On Tuesday, he said the case served as another example of “guilty until proven innocent,” comparing it to the chaotic confirmation process for Supreme Court Justice Brett Kavanaugh. And on Wednesday, Trump expressed scepticism as to whether Turkish officials had audio and video proving Khashoggi was killed. He also stressed the fact Khashoggi was not a US citizen – he was a US resident with a green card – as he boasted about billions of dollars of US arms sales to the Saudis. 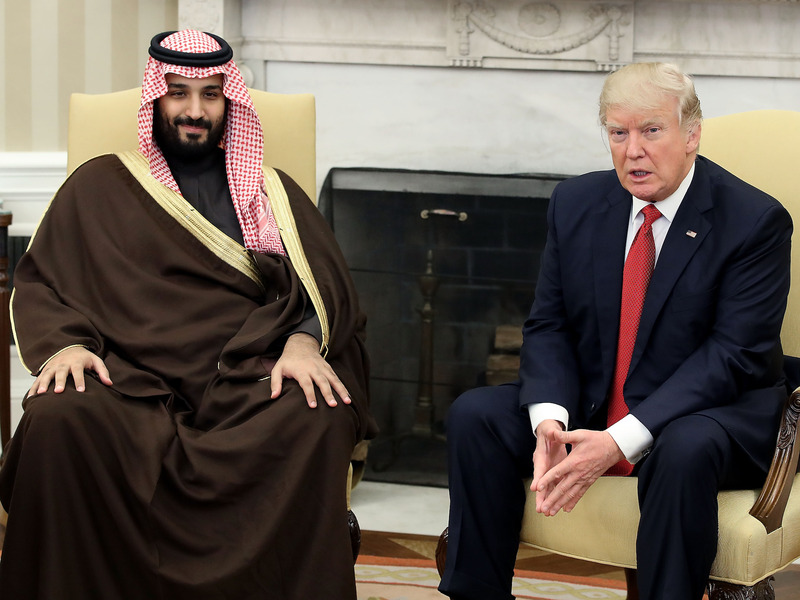 Randa Slim, director of conflict resolution at the Middle East Institute, told Business Insider she does not see Trump taking significant steps to reprimand the Saudis. She also said Trump’s approach to the situation will be similar to how he’s handled Russia’s meddling in the 2016 election. Trump has made a habit of placing trust in leaders with dubious reputations, perhaps most notably North Korean leader Kim Jong Un and Russian President Vladimir Putin. When Trump suggested “rogue killers” could be responsible for Khashoggi’s disappearance, it was similar to his suggestion during the 2016 campaign that a 400-pound hacker – not the Russian government – could be behind interference in the election. Trump, sounding very similar to his Putin interference denials, says that it could have been "rogue killers" who murdered Jamal Khashoggi. When Trump met with the Russian leader in Helsinki in July, he stunned observers when he indicated that he believed Putin over the US intelligence community, declined to denounce Putin, and suggested the FBI was part of a conspiracy to undermine his election victory. The comment was reminiscent of Trump’s deflection when the former Fox News host Bill O’Reilly referred to Putin as a “killer” during an interview amid the 2016 campaign.